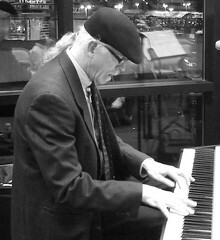 Michael Shea teaches piano at Powers Music School. He received his Bachelor of Music from University of Colorado and Master of Music degrees in jazz studies and composition from New England Conservatory. An active performer, Michael has performed with Eddie Harris, Jerome Richardson, Joe Turner, the Either Orchestra, and the Artie Shaw Band, among others. He currently writes, performs, and records with a variety of Boston area musicians, such as the Two Worlds Orchestra, as well as with his own ensemble, the Michael Shea Quartet. In addition to Powers, he has taught at Community Music Center of Boston and New England Conservatory's Extension Division.